Why I live here with the name I have. I have told bits and pieces of this before but not in chronological order – which almost is this time. My great grandfather William was born in Macon County, North Carolina, in 1842. His mother was Rebecca Trammell. Two years later his mother gave birth to a daughter, she named the girl after her: Rebecca. The mother Rebecca did not have a husband during the births. William and Rebecca used their maternal surname: Trammell. The mother Rebecca died before 1850. 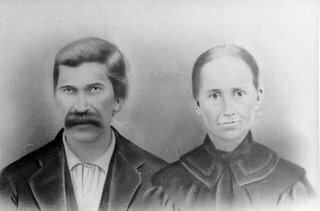 Their grandparents, Jacob B. and Polly Hogshed Trammell took the children in and raised them with their own. Polly was an Indian. Before 1860 she had drowned tending to her fish baskets in the Little Tennessee River in Franklin, Macon County, North Carolina. On, 1 May 1862, he enlisted in Macon County, North Carolina, into the 39th North Carolina Infantry, Company I. He was nineteen years old. His unit fought at several major events: Jackson, Mississippi, Mobile, Kennesaw Mountain, etc. Kennesaw Mountain? That is right here just outside the Marietta City Limits. Just before the Kennesaw Mountain fight William took an authorized furlough and went back to Franklin and married Emaline Ray. The Battle of Kennesaw Mountain took place in mid-June 1844. After the war had left the mountain and headed towards Kolb’s Farm near Smyrna and Powder Springs for whatever reason William and a few of his friends were still there. In October 1864, about three and half months later his unit would be fighting at Allatoona Pass, which many years later would be near the Allatoona Lake and the hydroelectric dam. But William would not be with them. He would be recuperating. He and his two friends were at one of the seven springs on or near Kennesaw mountain. One of his friends was bending over scooping up some water when suddenly a bullet hit him between his eyes, killing him instantly, and at the same moment William was shot in the knee and fell. His other friend (Posey C. Wild) took off running through the trees. William fell over and pretended to be dead as the yanks ran by in pursuit of his friend Posey. Not long after that William was placed in a private home in a small community just north of Woodstock, Georgia to recuperate. There he got to know the people locally and they became his friends. After it was declared the War was over it is said that William and a mule that was given to him walked back to his wife Emaline in Franklin. After people were beginning to get back to their routines after the war one day William’s Uncle Jacob Van Buren “Van” Trammell had a heated discussion with a Lambert man about the war. This Lambert man fought for the north, so, it was probably natural that he and Van did not see eye to eye. Van also fought for the South. They disagreed so intense Van hit the Lambert over the head with the stock of a rifle (one account) or a big stick (another account) and killed him. Apparently all clues led to Van. The sheriff questioned Van who said he wasn’t him, he was with William all that day. When the sheriff questioned William he concurred all that Van said. He was Van’s alibi. Somehow there was a hole in their story that the sheriff saw right through. The sheriff charged both men with murder. They fled. Incidentally, Mahala Trammell, oldest daughter of Jacob B. was married to a Lambert at one time. I do not know if the Lambert is the same Lambert as killed or not. Mahala was married secondly to Archebald Bateman and before the two she sued Andrew Colvard for Bastardy (for child support). 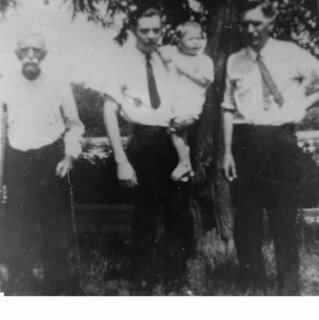 Van went to Arkansas and William went to Texas with his wife and son. That was about 1865 or 1866. 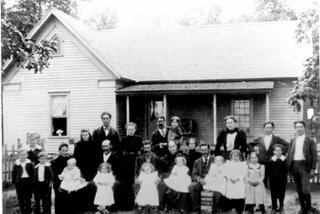 In 1879, after my grandfather was born in Paris, Texas, they came back east with their seven children. They did not go back to Franklin, but settled near Woodstock where he made friends about 14 years before. William changed his name. He was no longer William A. Trammell, his new name was William A. Hunter. That may have been the wisest thing to do, since William A. Trammell was wanted for murder. It appears the surname Hunter was his rightful paternal surname anyway. His mother Rebecca in 1842 sued Jason Henderson Hunter for Bastardy and was awarded child support of $100 a year. Letters exist between William and Jason recognizing each as a son or father. Jason had an interesting life. He was a soldier with the “Trail of Tears” . After that he was a farmer and constable in Franklin, NC, where he was sued for bastardy by Rebecca Trammell and Catherine Davis. Then he moved to Bollinger County, Missouri, where he became a state representative, then organized his own Confederate unit where he and his men fought under the famous Missouri Swamp Fox General M. Jeff Thompson fighting federal boats on the Mississippi. After the war he moved to Greene County, Arkansas, where he also became a state representative. Most impressive is that he went through three wives, three unmarried lovers, 15 legitimate children, and at least 5 illegitimate. Recently I was looking at “Trail of Tears” trail, and I noticed for the first time it went through every area Jason Henderson Hunter called home: Macon County, North Carolina, Bollinger County, Missouri, and Greene County, Arkanas. Once William and some of his grandsons went to Kennesaw Mountain to show where several events happened. Then he was old and walked stooped over. Several times he broke down crying remembering different incidents on the mountain. A few years ago I asked a park ranger behind the counter at the Kennesaw Mountain Civil War Museum where was William's unit at and he got out several indexed lists and maps and pointed out the area. It was on the ridge that goes between Kennesaw Mountain and Little Kennesaw Mountain, more on the Little Kennesaw Mountain side. I have walked over the general area several times since. William and Emaline Hunter settled on Main Street in Woodstock where they finished out their days. She died in 1925 and he died in 1928. He died after falling out of a barn loft, breaking his leg and he died not long after that. 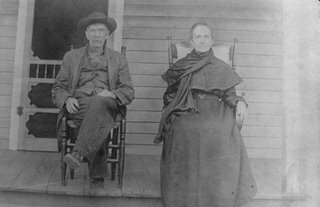 William and Emaline Ray Hunter had 9 children. Some stayed in Cherokee County, Georgia, and some went to Florida, one went to the Panama Zone (he helped built the Panama Canal), and my grandfather Frank Paris Hunter moved to Marietta. Frank and his wife Minnie Tyson had 9 children, most were born in Marietta, including my father, and the next generation, most of us many first cousins were born in Marietta. William’s sister Rebecca married Posey Wild’s son and one of their children also fell out of a barn loft, landing on a pitch folk and dying instantly. I am amazed that you know all that history, Eddie. How nice to know about your family. Later today or tonight, I am going to post a photo from 1910. I'll be looking forward to seeing it. Eddie, I'm so envious that you know so many details! What a great story of a man's life from the Civil War era! I think just about every southern family has a "and he limped home from ......." story. But if mine does, I don't know anything about it. I know have ancestors who fought in the war. But the only one I know of for sure belonged to a Florida regiment and fought in a battle in Marianna, FL. Thanks. I'm glad to see you back at it. I had an ancestor on my mother's side to fight in Florida, but not in the Civil War. It was the War of 1812. He started very young and was the drummer. Later he fought as a soldier... or it might have been the Indian Wars.... something anyway, hopefully I'll do a report on it some day. He was in the War of 1812. Enlisted in Milledgeville, Ga., in 1814 for a term of eighteen months. He was discharged at Fort Jack, near Savannah, Ga. He enlisted as a private and later was appointed musician, a fifer for the company. Records show he was discharged after both arms were broken in an accident while at work on barracks. I wonder if your ancestor fought in the Seminole War? Down in Decatur Co. there is a marker for Camp Recovery on the current shores of Lake Seminole (didnt' exist then) where men who were injured while fighting the Seminole Indians or who caught malaria went to recover. I don't remember why there was fighting between the settlers and the Seminoles. The wars between Georgia and Florida didn't start at the Cocktail Party in Jacksonville. We've technically had two skirmishes with those occupying or settling that state. The other, of course, being the victory over the Spanish at the Battle of Bloody Marsh. It was the War of 1812 which I told about 3 comments back. However, I know there is at least one, maybe more who of my relatives who fought in the Indian Wars. It may take a while, but I'll find them.